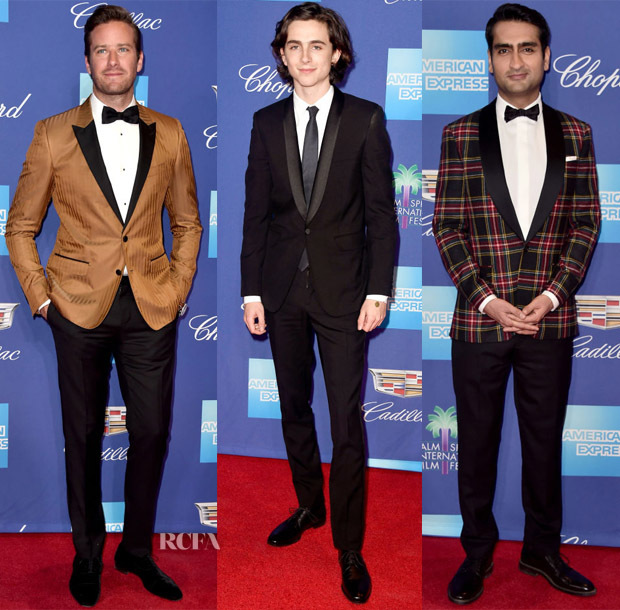 Here are three dashing gents who joined a host of lovely ladies for the Palm Springs International Film Festival Gala on Tuesday (January 2). Armie Hammer: Positioning himself as the golden boy of the evening, there was plenty of old-school charm to Armie’s Dolce & Gabbana suit styled with Louboutin shoes to be had. We tend to tire of the predictable menswear offerings, so how does this colour combo fare? Timothée Chalamet: Our best dressed male of 2017 started off on a classic note wearing a shawl lapel suit oozing plenty of elegance. Kumail Nanjian: You can never label Kumail’s style as boring. I love how his J. Crew Ludlow shawl-collar tuxedo has so much vibrancy thanks to the tartan blazer. Some might find it comedic, but it’s refreshing bold to me.